The Recording King Dirty 30's Tenor Banjo brings 100 years of history into the present, road-ready vibe of the Dirty 30's line. The tenor banjo first came to prominence in the early 1900's, and its C-G-D-A tuning is especially well suited for folk, Celtic and Dixieland music. The tenor is a unique banjo for players looking to add a traditional vibe to their sound, and the perfect crossover instrument for mandolin, violin, viola and cello players. 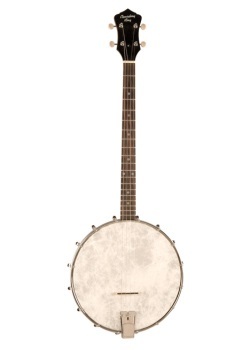 The Dirty 30's Tenor Banjo has the same road-ready styling as the rest of the Dirty 30's guitars and banjos. The narrow 19-fret neck is a pleasure to hold, and the 23” scale delivers the perfect combination of feel and crisp clarity. The open-back rim features 16 brackets holding down a REMO Fiberskyn head for the classic period-correct tenor sound.